All transactions are safe and secure with a reliable history in online purchasing behind each of our associates. Buy the General Lee Dukes of Hazzard Model Cars, General Lee Diecast Toy Cars to own Dukes of Hazzard clothing and merchandise. These collectible Dukes of Hazzard toy cars are available in the form of diecast replicas and models. The latter allows you to assemble your own 1969 Dodge Charger General Lee model kit. 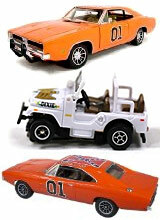 In addition to the classic General Lee diecast toys, you'll also find a Daisy Duke toy Jeep and Rosco P. Coltrane's 1977 Dodge Monaco diecast police car. In addition to the General Lee Dukes of Hazzard Model Cars, General Lee Diecast Toy Cars above, browse the Dukes of Hazzard Clothing Gallery for more apparel like men's and women's clothes, kids shirts or hoodies.